As an Occupational Safety and Health (OSH) practitioner have you ever wondered "How can I shape my career trajectory to reach a C-suite position in business?" Or perhaps—for those who do not aspire to positions of this nature; "How can I develop my ability to persuade and influence top management more effectively?" 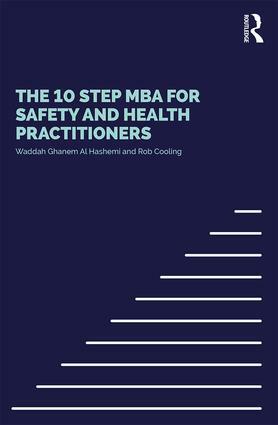 The 10 Step MBA for Safety and Health Practitioners answers these questions to enable you to achieve your personal and professional OSH goals. Distinctive – looking for creative new ways of presenting OSH data and information to generate interest and enthusiasm. From strategy and leadership to organisational behaviour and human resource management, from marketing and brand management to interpersonal skills, this book shows you how to combine the best of your specialist knowledge with important business tools, so you can embed OSH at the heart of your company. The book is an indispensable reference for OSH practitioners who want to make a positive change in their careers and become more effective in influencing and leading change.